KSM42 rentals include open-cage ShureLock Elastic-Suspension Shock Mount, Popper Stopper magnetic pop filter, aluminum carrying case and twenty-five foot (25') long XLR cable. Nationwide shipping available. The KSM42 premium side address cardioid condenser microphone with Prethos Advanced Preamplifier Technology and extensive pop-filter protection for exceptionally smooth proximity control and ultra-wide dynamic range. Ideal for world-class vocal recording and performance applications. 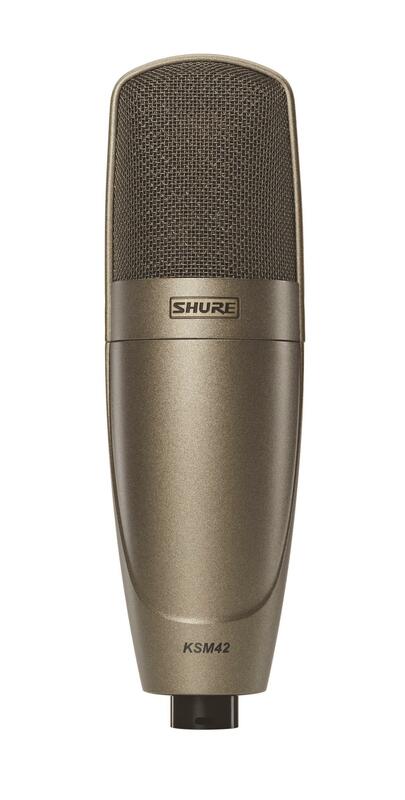 North Shore Productions rents the Shure KSM42 along with other premium microphones in the Shure KSM Series.